The year 2017 will mark the 30th anniversary of the equation formulated by Luigi Lugiato and Renè Lefever to provide a paradigm for pattern formation à la Turing in nonlinear optical systems . Chapter 28 of the book Nonlinear Optical Systems by L. Lugiato, F.Prati, M.Brambilla, published in 2015, is devoted to the illustration of the meaning and the predictions of such an equation, that in the following is indicated by LLE. Phenomena of spontaneous pattern formation, both of spatial and of temporal nature, are ubiquitous in the vast domain of nonlinear dynamical systems, encompassing for example hydrodynamics, chemistry, biology, population dynamics, and social sciences. 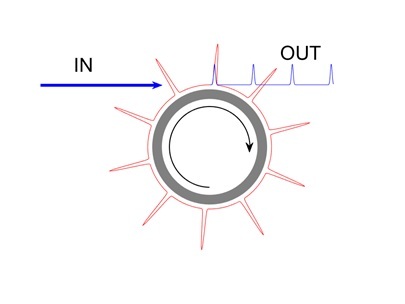 The LLE was conceived by following a criterion of simplicity, which led to the selection of an optical ring cavity containing a medium with a cubic Kerr nonlinearity and driven by a stationary coherent input field. The combination of the Kerr nonlinearity and of light diffraction gives rise to a rich variety of 1D and 2D patterns, and to cavity solitons, which develop in the transverse planes orthogonal to the longitudinal direction of propagation of light in the cavity. Some years after the introduction of the LLE Haelterman, Trillo and Wabnitz formulated the temporal/longitudinal version of the equation, in which diffraction is replaced by group velocity dispersion. In this case patterns and cavity solitons develop in the longitudinal direction, propagate along the cavity with the light velocity and generate a periodic train of pulses in the output of the cavity itself.. In this way, the LLE unifies spatial phenomena that arise in the transverse planes, with spatio-temporal effects that occur in the longitudinal direction. Fig.1. 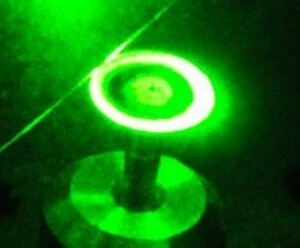 Christallyne disk-resonator standing on top of a metallic stub. Courtesy Aurelien Coillet, FEMTO-ST, University of Besancon. 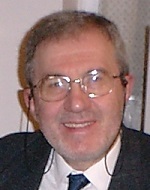 are foreseen to have a strong impact as a compact, low-cost, low-power, chip-compatible technology, and produce important applications to such fields as optical coherent communication in ultradense optical fiber networks, ultrastable microwave generation, spectroscopy, generation of entangled twin photon pairs with chip-scale resonators. This has stimulated a considerable worldwide effort in this approach . It has become clear that the LLE is the model for the description of Kerr comb generation and the prediction of the comb characteristics as a function of the system parameters . The spontaneous formation of travelling patterns along the cavity is the crucial mechanism which creates the combs and governs their features (see Fig. 2). Fig.2. 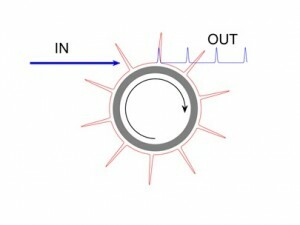 The injection of a uniform driving field on the left spontaneously generates, in the microring resonator, a pattern which travels clockwise and produces a periodic sequence of pulses in the output. In the frequency domain, the sequence of pulses corresponds to a broad band frequency comb. The spectacular progress in the field of photonics, occurred from thirty years ago, has realized all the rather idealized conditions assumed by the LLE. A curious consequence of such a history is that this equation is even more used now than at the times immediately after its formulation. In conclusion, the LLE represents a case of pattern formation which is immediately linked to a promising applicative avenue.